Catch big-league, real-time audio via Wi-Fi with the all-new, all-in-one Hearing HotSpot Server. This next-gen technology broadcasts up to 16 stereo or 32 mono channels (per server box) of better-than-MP3 audio quality directly to an individual’s smartphone or tablet. Advanced software algorithm delivers audio with ultra-low latency. In-app links offer each venue the option of customizable advertising. Purpose-built hardware components and innovative software offer exceptional performance and trouble-free operation. 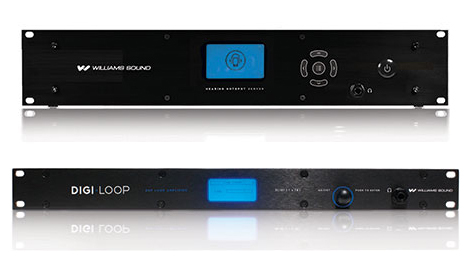 Williams Sound raises the bar for loop system features and performance with the addition of the new DL107 NET and DL207 NET to its line-up of loop amplifiers. Network control and optional Dante audio inputs top an impressive feature list. DSP audio processing provides superior sound, and online calibration tools offer ease of installation. The single output (7.0 amps) DL107 is ideal for perimeter and single array installations. The dual-output (2x 7.0 amps) DL207 highlights dual-amp or phased-array installs.